All mothers will agree with me when I say that feeding our children seems to be the main aim of our lives now. We wait and watch to see what will catch the fancy of our kids and then stock up our kitchens with that. Just when you think junior likes something in particular, there they go all turncoat on you and act as in you are trying to shove castor oil down their throats. Anoushka recently went through a phase of bananas. After wanting the fruit, morning, noon and night (in the middle of it as well), she got up one fine morning and decided, ok... no more bananas. And that's how I ended up with almost a dozen on my hands, on the verge of going bad. So a panic call to mom and she fished out an old recipe of my grandmother's. My mom has a total of nine siblings and this was amongst the easiest sweet dishes one could make for such a brood. I quite liked the end result. Ingredients: About a dozen small plaintains, 4 heaped tsps of sugar (you could adjust this with the sweetness of the plaintains, around 6 level tbsps of maida (again, you will have to adjust this to get the right consistency), a little bit of water, oil for deep frying. Peel the bananas and mash them well in a bowl. Add to this sugar, maida and mix together well. You need to get the consistency of very thick batter. Add a bit of water if necessary. If you can shape this into balls, well and good. 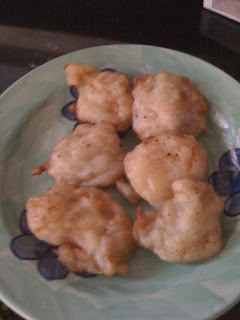 If not, heat oil, when it is nice and hot, spoon in the batter. Fry till they are golden brown. Drain them on kitchen tissue and they are ready to serve.